With summer rolling out, now is the time all those wedding invitations appear in the mail and your budget starts to feel the pinch. While weddings are usually a fun way to get together with lots of family and friends to celebrate a couple’s love, it can also be stressful to figure out how to afford to pay for everything that goes along with the wedding. From airfare and accommodations for an out-of-town wedding, to gifts, dresses, and bridal showers, the tab can quickly and easily get out of hand. Here are some tips on how to keep the wedding season spending under control and in a price range that will have you enjoying the festivities rather than stressing about the budget. These days, the range on a wedding gift can vary. There are several factors that go into how much to spend on a gift: how close are you to the couple? Are you traveling to the wedding? Did you already buy a bridal shower gift too? Experts say anything between the $50-$100 range is appropriate depending on your level of closeness to the couple, and how much you’ve already spent on other items for their wedding. Many couples now set up registries making it a cinch to pick out a gift. However, there are still savings to be had. If a couple registers at Bed, Bath, and Beyond, you can always use one of those 20% off coupons that are prevalent in the mail to score even greater savings. Several stores will also charge you an additional $5-10 just for shipping! I easily saved around $20 by skipping the online shipping, going to the store myself, and using a 20% off coupon when our friends registered at Macy’s. Do a quick search for coupons before buying a gift. Headed to a destination wedding? While you may not have a ton of flexibility with dates, you can still save a lot by flying out on a Thursday or Monday instead of the more popular days, Friday and Sunday. Also, shop for deals online before booking your travel; you may find that booking separately from the wedding party will actually provide you greater savings. If you run with the same circle of friends, chances are you don’t want to repeat the same dress over and over again! But buying cocktail dresses can get expensive quickly. Try shopping at places like TJ Maxx or Ross to find great clothing options at a discount. Or if you’re in the bargain hunting mood, make a trek to your local consignment store, where designer dresses can often go for a fraction of the price. Don’t have the time or the patience for bargain hunting? Consider renting a designer dress at discount prices from a site like Rent the Runway where you can score $25 off your first order. Wedding season can easily put a dent in your budget, but it’s still possible to reduce spending and have a fabulous time without breaking the bank—it just takes a little extra effort. 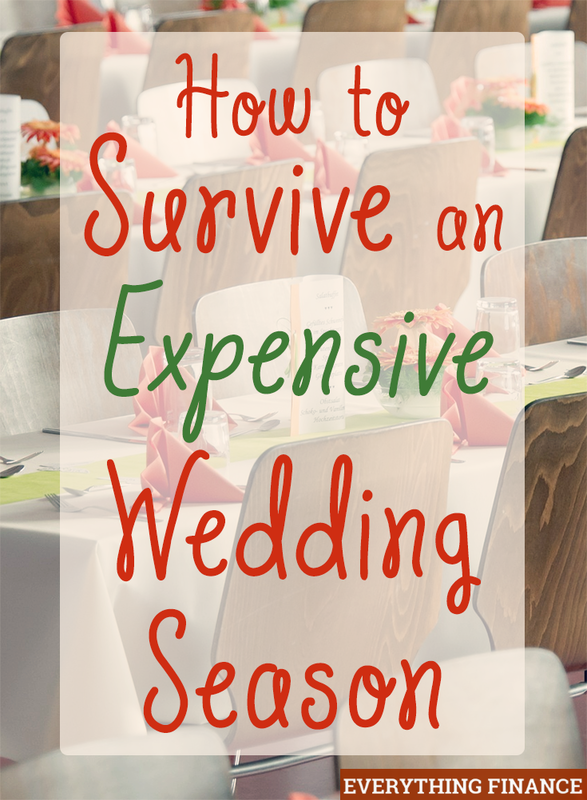 How do you save on weddings as a guest? What’s the most you spend on a gift?